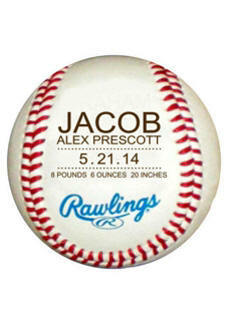 Personalized baby gifts are our specialty. 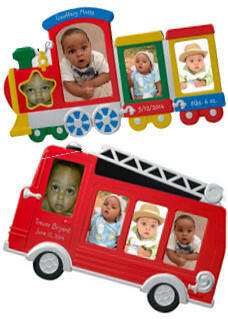 We focus on bringing you custom baby gifts that bring fun and joy to every baby. Maybe you are looking for baby shower gifts or something new for your little one. Proud parents love their baby's name and birth date on their baby gifts making personalized baby gifts unique and welcome. 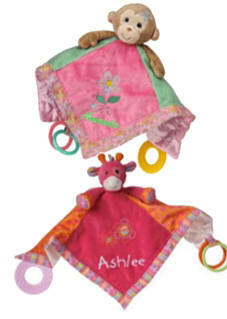 Our selection of gifts for baby includes classic gifts such as Taggies, Bunnies by the Bay, Baby Bearington, and more. We shop the largest American Gifts Markets to bring you a large and wonderful baby gift selection such as baby cups, baby spoon, baby photo frames, baby photo album, baby blankets, baby coin banks, baby brush and comb sets, baby's first bible, baby announcement pens and more! In addition, we offer personalized gifts for all occasions, making it easy to find last minute baby shower gifts, so be sure to keep us in mind and visit our site for all your baby gift giving occasions.